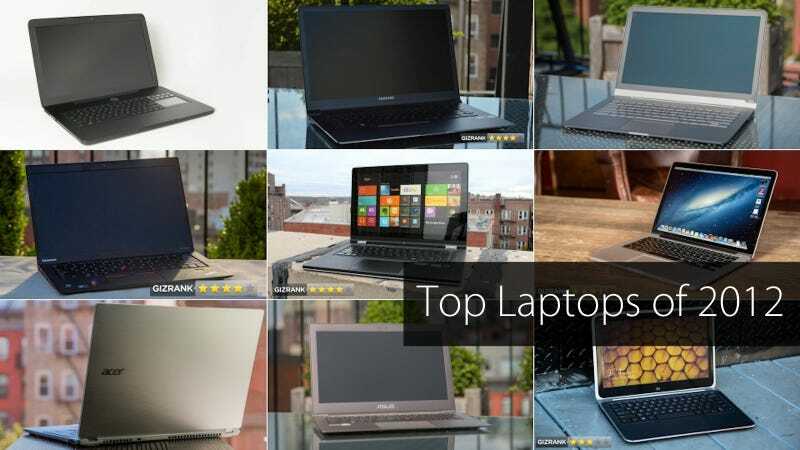 2012 was a big year for laptops. Windows 8 came along with its touch-centric worldview, Intel kept plugging away on its ultrabook crusade, and Apple finally started pumping out Retina MacBooks. Here's our list of the most important machines of the year. This is a statement of intent from Acer, and really all Windows laptops. Along with Samsung's Series 9, this is the most impressively designed and built laptop we've seen. Apple included. It's just wonderful, with a gorgeous, bright capacitive touch 1080p display crammed onto its 11-inch body. Acer has a few kinks to work out, like that undersized trackpad, before this really takes off, but it was the arrival of a new big time player in laptops, and a reaffirmation that Windows can be beautiful. I&apos;ve been chasing the perfect PC laptop for over a decade now. Asus's Zenbooks have been some of the most popular ultrabooks out, but this year's UX31A was notable for its gorgeous 1080p screen, which outshines anything short of a Retina display from Apple. The Zenbooks still have keyboard and trackpad issues to deal with, but pushing great displays on nice laptops at affordable prices is pretty important. Samsung's Series 9 was already really good last year—it was our favorite ultrabook at the time—but its total redesign this year cemented it as the most gorgeous laptop you can own. Period. We didn't love what that did to the keyboard, but wrestling "best looking laptop" away from Apple is a big deal, especially when it does't look like Cupertino's going to take it back any time soon. Early this year, ultrabooks were still getting off the groups, taking their first awkward, unsure steps toward being good and viable. Dell's XPS 12 was one of the first to really get almost everything right while also embracing a lot of Intel's features, which early ultrabooks avoided. It came in between the first and second waves of ultrabooks, and set a template for build quality and usability. The Vizio Thin + Light looked like it had a chance to be something special when we saw it at CES, and it didn't quite live up to that. But it's still the first laptop out of bootstraps-up TV-maker Vizio, and it showed enough promise that we're excited to see if it can improve on things next year. Chromebooks aren't for everyone, but they're excellent little internet machines, and just about all a lot of people need out of a computer. And a $200 price tag is a big deal for a machine that actually works (and won't make everyone who touches it want jump off of a building). The new Razer Blade looks basically identical to the first Blade, which was released this spring. But the new model has all new guts—including a bump up to a GeForce GTX 660M—that are finally good enough to make Razer's attempted defragmentation of the PC gaming market a possibility. The price still has to come down, but Razer's doing important stuff. The Retina MacBook Pro was probably inevitable, but that doesn't stop it from being important. It was the first ultra-high resolution laptop display, and unlike the extravagantly expensive 13-inch version, it actually performed up to its price tag.